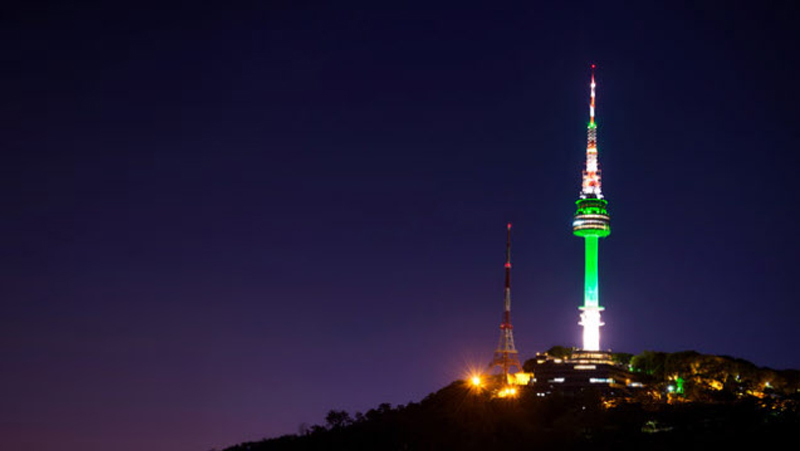 Tourists have chosen N Seoul Tower with its panoramic views as the top sightseeing spot in the capital. The Seoul Metropolitan Government conducted an online poll from Sept. 1 to 20 asking foreign and Korean tourists to choose the top 20 sightseeing attractions in the capital. Some 12,000 people picked N Seoul Tower atop Mt. Nam. Also high on the list were Gyeongbok Palace, the Cheonggye Stream, the Namsangol Hanok Village of traditional homes, Deoksu Palace, the headquarters of SM Entertainment, and the Floating Islands on the Han River Park. A Seoul city official said, "Tourists chose attractions that were either locations of popular TV programs or neighborhoods that were home to popular talent management agencies." Gyeongbok Palace was the location of the popular costume drama, "Moon Embracing the Sun" starring Kim Soo-hyun. The Floating Islands gained fame after they appeared in the TV dramas, "Iris" and "She Was Pretty." Chonggye Stream, Deoksu Palace, and Lotte World were shown in episodes of the popular entertainment programs "Running Man" and "Infinite Challenge." Many tourists wanted to meet Korean stars. SM Entertainment's complex in COEX, which opened in January last year, ranked seventh because they can get hands-on experience in music recording and album production there. The street themed around K-pop stars in the trendy Apgujeong neighborhood in southern Seoul is home to the headquarters of FNC, JYP, SM and other big talent mills. "We plan to step up publicity for the top 10 locations," the official said.